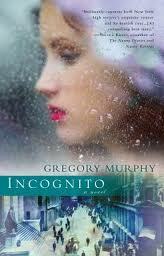 Set in New York City at the turn of the twentieth century, Incognito tells the story of William Dysart, a lawyer stuck in a loveless marriage to a very beautiful woman, in a fantastic job that he hates, and with a very very rich father for whom he seems to have no affection. Yes, Mr. Dysart has everything one could ask for, but none of it makes him happy. That is until he's assigned a peculiar task by his firm, a task that sets him at odds with everyone he knows and spirals him into an exploration of his own history. The novel is graced along the way with magnificent descriptions of Manhattan and Long Island during the city's guilded age. While the story is billed as a mystery, it's almost more of a gentleman's late coming-of-age story. It's not very often that I find myself getting caught up in, or sympathetic with stories told from a man's perspective, but I found Dysart to be very sympathetic, and likable despite his mistakes. There was a lot more to this book than I had initially expected, and even though some of the subjects at its core are despicable, the story around them is told with simple, genuine elegance. Definitely a quick and lovely read, filled with vivid descriptions that will captivate any reader of historical fiction. Absolutely brilliant description of this great story. The social and physical landscaping of Manhattan and Long Island make this book unforgettable.